Varicella-zoster virus (VZV) causes chickenpox and herpes zoster (shingles). Chickenpox follows initial exposure to the virus and is typically a relatively mild, self-limited childhood illness with a characteristic exanthem, but can become disseminated in immunocompromised children. Reactivation of the dormant virus results in the characteristic painful dermatomal rash of herpes zoster, which is often followed by pain in the distribution of the rash (postherpetic neuralgia). See the image below. Typical zoster in the vicinity of right popliteal fossa in a vertebral nerve L4 distribution. Pain and paresthesia are typically the first symptoms of VZV infection. Until the characteristic vesicular rash erupts, diagnosis may be difficult. A prodromal period during which symptoms may vary is common. Pain occurs in 41% of patients, itching in 27%, and paresthesias in 12%. VZV infection may reactivate without causing cutaneous vesicles. These patients have severe dermatomal pain, possible motor weakness and possible hypesthesia, but no visible rash or vesicles. Caused by reactivation of VZV infection in the ophthalmic division of the trigeminal nerve. Antiviral medications decrease the duration of symptoms and the likelihood of postherpetic neuralgia, especially when initiated within 2 days of the onset of rash. Oral acyclovir may be prescribed in otherwise healthy patients who have typical cases. Compared with oral acyclovir, other medications (eg, valacyclovir, penciclovir, famciclovir) may decrease the duration of the patient's pain. Varicella-zoster virus (VZV) is the cause of chickenpox and herpes zoster (also called shingles). Chickenpox follows initial exposure to the virus and is typically a relatively mild, self-limited childhood illness with a characteristic exanthem. Approximately 1 per 4000 children develops VZV encephalitis, an acute neurologic disorder with potentially severe complications. In addition, immunocompromised children (eg, those receiving chemotherapy for leukemia or those with advanced HIV infection) can develop disseminated VZV infection, a potentially fatal complication. After primary infection, VZV remains dormant in sensory nerve roots for life. Upon reactivation, the virus migrates down the sensory nerve to the skin, causing the characteristic painful dermatomal rash. After resolution, many individuals continue to experience pain in the distribution of the rash (postherpetic neuralgia). In addition, reactivation of VZV infection can cause a spectrum of atypical presentations, ranging from self-limited radicular pain without rash to spinal cord disease with weakness. The host immunologic mechanisms suppress replication of the virus. Reactivation can occur if host immune mechanisms are compromised. This may be caused by medications, illness, malnutrition, or by the natural decline in immune function with aging. Upon reactivation, the virus migrates along sensory nerves and produces sensory loss, pain, and other neurologic complications. If motor nerve roots are also involved, weakness can develop in addition to sensory changes. Leptomeningeal involvement is rare but may develop when the ophthalmic branch of the trigeminal nerve is involved. The rate of occurrence is about 5 persons per 1000 population. Immunosuppression increases this risk. The risk of postherpetic neuralgia increases with age. Approximately 50% of patients older than 60 years may have temporary or prolonged pain syndrome. The frequency of VZV infection may decrease as the immunized children become adults. VZV infection occurs with the same frequency in the United States and internationally. Severe pain and insomnia are most bothersome to patients. About 95% of patients with zoster experience severe pain during the illness. Other presentations of zoster, including ocular (keratitis) and spinal cord (myelitis) presentations, may result in additional morbidity. Bacterial superinfection (impetiginization) of vesicular skin lesions can occur. The vesicular eruption of VZV infection may be more difficult to diagnose in patients with darker skin. VZV infection occurs with equal frequency in males and females. After primary infection, zoster can occur at any age. However, the risk of zoster increases with age. The risk of postherpetic neuralgia also increases with advancing age. Furuta Y, Fukuda S, Suzuki S, et al. Detection of varicella-zoster virus DNA in patients with acute peripheral facial palsy by the polymerase chain reaction, and its use for early diagnosis of zoster sine herpete. J Med Virol. 1997 Jul. 52(3):316-9. [Medline]. Centers for Disease Control and Prevention (CDC. Updated recommendations for use of VariZIG – United States, 2013. Available at http://www.cdc.gov/mmwr/preview/mmwrhtml/mm6228a4.htm?s_cid=mm6228a4_w. Accessed: July 23, 2013. Shapiro ED, Vazquez M, Esposito D, Holabird N, Steinberg SP, Dziura J, et al. Effectiveness of 2 doses of varicella vaccine in children. J Infect Dis. 2011 Feb 1. 203(3):312-5. [Medline]. Pahud BA, Glaser CA, Dekker CL, Arvin AM, Schmid DS. Varicella zoster disease of the central nervous system: epidemiological, clinical, and laboratory features 10 years after the introduction of the varicella vaccine. J Infect Dis. 2011 Feb 1. 203(3):316-23. [Medline]. Brink AA, van Gelder M, Wolffs PF, Bruggeman CA, van Loo IH. Compartmentalization of acyclovir-resistant varicella zoster virus: implications for sampling in molecular diagnostics. Clin Infect Dis. 2011 Apr 15. 52(8):982-7. [Medline]. Kubeyinje EP. Cost-benefit of oral acyclovir in the treatment of herpes zoster. Int J Dermatol. 1997 Jun. 36(6):457-9. [Medline]. Ready T. Varicella-Zoster Virus Globulin: New CDC Recommendations. Medscape Medical News. Available at http://www.medscape.com/viewarticle/808220. Accessed: July 30, 2013. Updated Recommendations for Use of VariZIG - United States, 2013. MMWR Morb Mortal Wkly Rep. 2013 Jul 19. 62(28):574-6. [Medline]. Dworkin RH, Barbano RL, Tyring SK, Betts RF, McDermott MP, Pennella-Vaughan J, et al. A randomized, placebo-controlled trial of oxycodone and of gabapentin for acute pain in herpes zoster. Pain. 2009 Apr. 142(3):209-17. [Medline]. Dooling KL, Guo A, Patel M, Lee GM, Moore K, Belongia EA, et al. Recommendations of the Advisory Committee on Immunization Practices for Use of Herpes Zoster Vaccines. MMWR Morb Mortal Wkly Rep. 2018 Jan 26. 67 (3):103-108. [Medline]. [Full Text]. [Guideline] CDC. Recommended Immunization Schedule for Adults Aged 19 Years or Older, United States 2018. Centers for Disease Control and Prevention. Available at https://www.cdc.gov/vaccines/schedules/hcp/adult.html. 2018 Feb 06; Accessed: February 6, 2018. Lal H, Cunningham AL, Godeaux O, Chlibek R, Diez-Domingo J, Hwang SJ, et al. Efficacy of an adjuvanted herpes zoster subunit vaccine in older adults. N Engl J Med. 2015 May 28. 372 (22):2087-96. [Medline]. [Full Text]. Cunningham AL, et al. Efficacy of the Herpes Zoster Subunit Vaccine in Adults 70 Years of Age or Older. N Engl J Med. 2016 Sep 15. 375 (11):1019-32. [Medline]. [Full Text]. Klein NP, Fireman B, Yih WK, Lewis E, Kulldorff M, Ray P, et al. Measles-mumps-rubella-varicella combination vaccine and the risk of febrile seizures. Pediatrics. 2010 Jul. 126(1):e1-8. [Medline]. Hviid A. Measles-mumps-rubella-varicella combination vaccine increases risk of febrile seizure. J Pediatr. 2011 Jan. 158(1):170. [Medline]. [Full Text]. Tseng HF, Smith N, Harpaz R, et al. Herpes zoster vaccine in older adults and the risk of subsequent herpes zoster disease. JAMA. 2011 Jan 12. 305(2):160-6. [Medline]. Schmader K, Levin M, Gnann J, McNeil S, Vesikari T, et al. Efficacy, immunogenicity, safety, and tolerability of zoster vaccine (ZV) in subjects 50 to 59 years of age (Poster/Abstract). Infectious Diseases Society of America. The 48th Annual Meeting of the Infectious Diseases Society of America. 10-21-2010. Vancouver, British Columbia, Canada:Ref Type: Abstract: 3363. Pierson DL, Mehta SK, Gilden D, et al. Varicella zoster virus DNA at inoculation sites and in saliva after Zostavax immunization. J Infect Dis. 2011 Jun 1. 203(11):1542-5. [Medline]. [Full Text]. Moodley A, Swanson J, Grose C, Bonthius DJ. Severe Herpes Zoster Following Varicella Vaccination in Immunocompetent Young Children. J Child Neurol. 2019 Jan 10. 883073818821498. [Medline]. Ogita S, Terada K, Niizuma T, Kosaka Y, Kataoka N. Characteristics of facial nerve palsy during childhood in Japan: frequency of varicella-zoster virus association. Pediatr Int. 2006 Jun. 48 (3):245-9. [Medline]. Galil K, Choo PW, Donahue JG, Platt R. The sequelae of herpes zoster. Arch Intern Med. 1997 Jun 9. 157(11):1209-13. [Medline]. Rowbotham MC, Fields HL. The relationship of pain, allodynia and thermal sensation in post-herpetic neuralgia. Brain. 1996 Apr. 119 ( Pt 2):347-54. [Medline]. Oaklander AL, Romans K, Horasek S, et al. Unilateral postherpetic neuralgia is associated with bilateral sensory neuron damage. Ann Neurol. 1998 Nov. 44(5):789-95. [Medline]. Baik JS, Kim WC, Heo JH, Zheng HY. Recurrent herpes zoster myelitis. J Korean Med Sci. 1997 Aug. 12(4):360-3. [Medline]. Carreau JP, Gola R, Cheynet F, Guyot L. [Zona of the cranial nerves. Current aspects]. Rev Stomatol Chir Maxillofac. 1998 Oct. 99(3):155-64. [Medline]. [Guideline] Centers for Disease Control and Prevention (CDC); Advisory Committee on Immunization Practices (ACIP). Update: recommendations from the Advisory Committee on Immunization Practices (ACIP) regarding administration of combination MMRV vaccine. MMWR Morb Mortal Wkly Rep. 2008 Mar 14. 57(10):258-60. [Medline]. Cohen JI. Varicella-zoster virus. The virus. Infect Dis Clin North Am. 1996 Sep. 10(3):457-68. [Medline]. Cohen JI, Brunell PA, Straus SE, Krause PR. Recent advances in varicella-zoster virus infection. Ann Intern Med. 1999 Jun 1. 130(11):922-32. [Medline]. Devinsky O, Cho ES, Petito CK, Price RW. Herpes zoster myelitis. Brain. 1991 Jun. 114 (Pt 3):1181-96. [Medline]. Fabian VA, Wood B, Crowley P, Kakulas BA. Herpes zoster brachial plexus neuritis. Clin Neuropathol. 1997 Mar-Apr. 16(2):61-4. [Medline]. Feder HM Jr, LaRussa P, Steinberg S, Gershon AA. Clinical varicella following varicella vaccination: don't be fooled. Pediatrics. 1997 Jun. 99(6):897-9. [Medline]. Gilden DH, Cohrs RJ, Mahalingam R. VZV vasculopathy and postherpetic neuralgia: progress and perspective on antiviral therapy. Neurology. 2005 Jan 11. 64(1):21-5. [Medline]. Goh CL, Khoo L. A retrospective study of the clinical presentation and outcome of herpes zoster in a tertiary dermatology outpatient referral clinic. Int J Dermatol. 1997 Sep. 36(9):667-72. [Medline]. Goldman GS. Universal varicella vaccination: efficacy trends and effect on herpes zoster. Int J Toxicol. 2005 Jul-Aug. 24(4):205-13. [Medline]. Hong JJ, Elgart ML. Gastrointestinal complications of dermatomal herpes zoster successfully treated with famciclovir and lactulose. J Am Acad Dermatol. 1998 Feb. 38(2 Pt 1):279-80. [Medline]. Hovens MM, Vaessen N, Sijpkens YW, de Fijter JW. Unusual presentation of central nervous system manifestations of Varicella zoster virus vasculopathy in renal transplant recipients. Transpl Infect Dis. 2007 Sep. 9(3):237-40. [Medline]. Liang MG, Heidelberg KA, Jacobson RM, McEvoy MT. Herpes zoster after varicella immunization. J Am Acad Dermatol. 1998 May. 38(5 Pt 1):761-3. [Medline]. Mainka C, Fuss B, Geiger H, et al. Characterization of viremia at different stages of varicella-zoster virus infection. J Med Virol. 1998 Sep. 56(1):91-8. [Medline]. Morgan R, King D. Characteristics of patients with shingles admitted to a district general hospital. Postgrad Med J. 1998 Feb. 74(868):101-3. [Medline]. Nagel MA, Gilden DH. The protean neurologic manifestations of varicella-zoster virus infection. Cleve Clin J Med. 2007 Jul. 74(7):489-94, 496, 498-9 passim. [Medline]. Rowbotham MC, Davies PS, Verkempinck C, Galer BS. Lidocaine patch: double-blind controlled study of a new treatment method for post-herpetic neuralgia. Pain. 1996 Apr. 65(1):39-44. [Medline]. Sparks L, Russell C. The new varicella vaccine: efficacy, safety, and administration. J Pediatr Nurs. 1998 Apr. 13(2):85-94. [Medline]. Stein GE. Pharmacology of new antiherpes agents: famciclovir and valacyclovir. J Am Pharm Assoc (Wash). 1997 Mar-Apr. NS37(2):157-63. [Medline]. 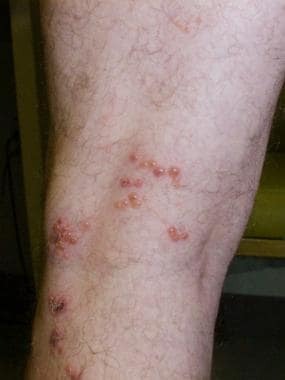 Sugisaki K, Yoshida H. Varicella zoster virus meningoencephalitis accompanied by sporadic skin lesions in an older immunocompetent adult. J Infect Chemother. 2007 Aug. 13(4):270-2. [Medline]. Svozilkova P, Rihova E, Diblik P. Varicella zoster virus acute retinal necrosis following eye contusion: casereport. Virol J. 2005 Aug 31. 2:77. [Medline]. Vu AQ, Radonich MA, Heald PW. Herpes zoster in seven disparate dermatomes (zoster multiplex): report of a case and review of the literature. J Am Acad Dermatol. 1999 May. 40(5 Pt 2):868-9. [Medline]. Westenend PJ, Hoppenbrouwers WJ. [Fatal varicella-zoster encephalitis; a rare complication of herpes zoster]. Ned Tijdschr Geneeskd. 1998 Mar 21. 142(12):654-7. [Medline]. Galetta KM, Gilden D. Zeroing in on zoster: A tale of many disorders produced by one virus. J Neurol Sci. 2015 Oct 3. [Medline]. Human herpesvirus (HHV) type 3. Intraoral herpes zoster closely resembles recurrent HHV-1 infection, but the lesions generally follow a dermatome and stop sharply at the midline, as shown here. However, the rules for common sites of occurrence of HHV-1 and HHV-3 often do not apply to patients who are immunocompromised. Courtesy of Sheldon Mintz, DDS. The authors and editors of Medscape Reference gratefully acknowledge the contributions of prior coauthor Amar Safdar, MD, to the development and writing of this article.